Ain’t socialized health care grand? From Daily Mail: Almost 70,000 operations were cancelled in the NHS in England last year due to a lack of beds, staff or equipment, according to new figures. The numbers, obtained by the Daily Mirror through Freedom of Information requests, were described by Labour as ‘nothing short of a scandal’. And the true total could be higher, as only 138 out of 170 NHS trusts responded to the paper’s query. In total, the trusts which replied reported 214,000 non-clinical cancellations in 2017/18, up 9% on the previous year and 29% on the 166,000 recorded in 2013/14. Of these, some 29,869 were caused by a lack of beds – up 59% on the 18,783 seen in 2013/14. Staff shortages were blamed for 29,550 cancellations – up 73%. 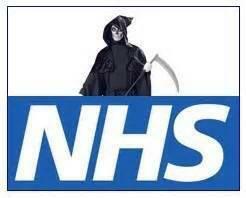 And 10,334 procedures were halted due to equipment or theatres being unavailable – a rise of 48%.